Made up of 3.81cm x 3.81cm, (1 ½" x 1 ½") 12 1/2G PVC coated wire mesh enclosure and molded fiberglass base. Frame dimensions: 60.96cm dia x 182.88cm high, (24"d by 72"h). Base dimensions: 60.96cm dia x 35.56cm high, (24" dia. X 14" high). 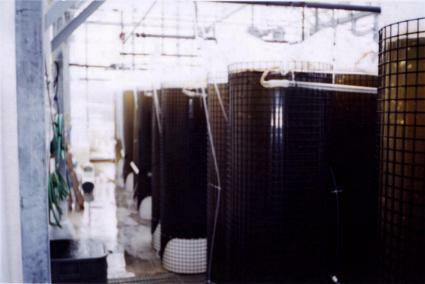 Used with algal bags to grow algae for hatchery or nursery use.